The rework of the Choosle comparison table appears cleaner and moves even closer to the popular view of a comparison matrix with the factors placed in the left fixed column. The rendering performance of the new grid has increased considerably and allows you to browse also bigger Choosles on less powerful machines. A toolbar in the top left corner of the grid allows you to directly access major features. 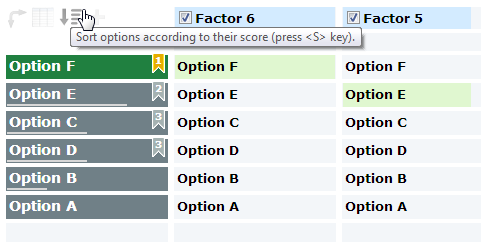 By default options are represented as columns and the factors, criteria as rows. With the swap feature you can transpose this representation and see the options as rows with their arguments in the columns per factor. This allows you to quickly compare the arguments of one factor for all the options. It also shows Choosles with many options and few factors more elegantly. 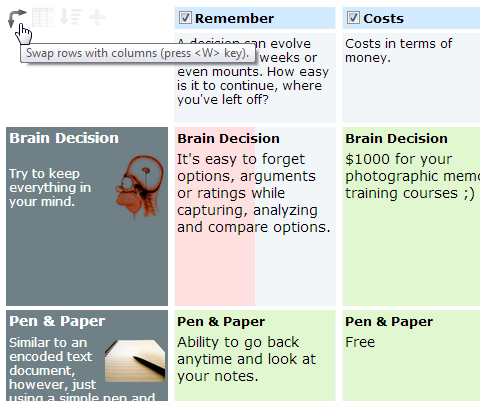 Many detailed view settings have been summaries to one compact view, accessible via the toolbar. The summaries and factor titles for the arguments are hidden and only the first characters of the argument texts are shown. The swapped, compact view replaces the option ranking list and allows to quickly reorder, add, remove the options. Another toolbar feature is the one-click row sort. and in the swapped view the options by their score to form a ranking list.